Life, Love, and a Polar Bear Tattoo was immediately engrossing for me. I never hesitated in following Candice down whatever thought process or path she was taking and could see parts of myself in her immediately. Wardell did a great job of making her personable from the first page. My gut reaction to Wardell’s novel is that this could be any woman in any marriage, anywhere, at any time. There are always things that trigger a re-examination of your wants in your life. In this case husband Ian’s drawing away and blaming Candice for the death of his parents (however irrational) is something that could happen in any relationship. The way someone reacts will always have an effect on those around us. The story line was natural to me and I honestly wasn’t sure how I wanted it to end up. I wish we had known more about Ian initially as he was given a bad start - perhaps the reader needs this lack of knowledge to be able to accept Candice’s confusion about her ex? I’m not sure it was necessary, though to give him no voice until the end - we could have heard him through responses to her emails perhaps? One thing that stuck with me was the intensity of the heat at points - I got entirely too wrapped up in some of the scenes but refuse to give out more details than that- praise to Wardell for writing passionately! My only little quibble was with Candice’s friends. I didn’t like any of them much, and although I could see her best buddy’s position on her situation I just didn’t take to her and found the other friends all a bit flaky. I thought Candice could have used a real sounding board at points instead of conflicting opinions. I suppose that’s real life though. 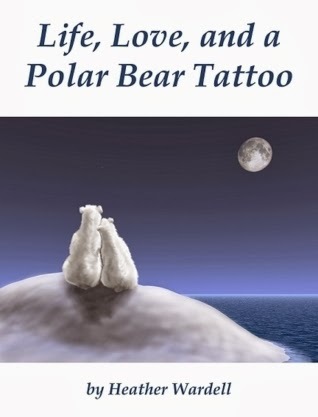 Thank you to Heather Wardell for making Life, Love, and a Polar Bear Tattoo a FREE download! All opinions are our own.